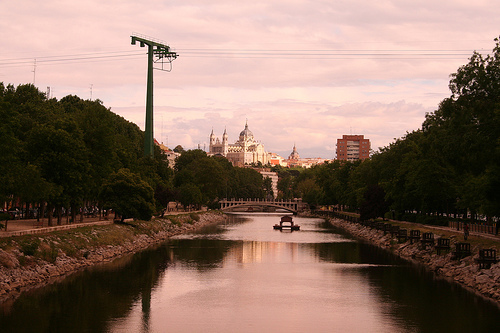 There is a river that runs through Madrid. It’s called the Manzanares, and he’s right. It is ugly. But I don’t mind taking the Renfe if it gets me out of Vallecas. So, I go alone and he’s right. It is ugly. Maybe he told me to get off at Principe Pio. Maybe it was Puerta Del Angel. I can’t remember now. But I wind my way through orangy brick tenements, with green, mangled awnings before I see the river and make my way to the Puente de Segovia. It’s nothing to see. I cross, pretending it’s the Pont Neuf or the Pont Alexandre III in Paris. I practice pronouncing the line in my head that some day I will speak if I ever go back: Je suis a la recherche d’ une personne du nom de… And I remember the nights I stood at the Pont St. Michel at three in the morning, soul kissing the American after dancing all night at Le Balad’jo. It hurts to do this. But the Manzanares is ugly, and I am useless and apoplectic when it comes to finding beauty when it isn’t there. I’m not creative enough. The water is black. The air is cold. And there are huge concrete cinder blocks left like debris on the sides of the bank. I head back down the understated arc of the overpass. It’s late in the afternoon and I don’t want the Spaniard to worry. But I’m lost—I miss the turn at Calle Caramuel and keep heading down Antonio Zamora instead—looking for the entrance to the Metro, wandering down a street where a Peruvian immigrant sings an unknown song of sorrow, tremulous and pulsating, from a terraza draped in laundry three flights up. This entry was posted in Uncategorized and tagged Bits & Pieces, fiction, flamenco, flash fiction, France, gypsy, Love, Madrid, manzanares river, Paris, Spain, Travel on June 16, 2010 by sevenperfumes.